…to deliver spe­cific stim­uli ‚Äî dosages of rhythm, har­mony or dis­so­nance and tim­bre ‚Äî at the appro­pri­ate time and in an effec­tive sequence. 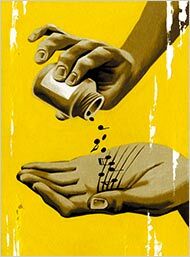 It’s an inter­est­ing con­ceit to con­sider that we composers–not doctors–have the power to deliver a dose of medicine! The arti­cle ref­er­ences, for instance, Source­Tone Inter­ac­tive Radio, “the world’s pre­miere music health ser­vice.” The whole phe­nom­e­non is reported by Matthew Gure­witsch in the New York Times. Click here for the full arti­cle.